In February 1906, the Silver Wedding Anniversary of the German Emperor and Empress was turned into a double wedding celebration when they gave their second son, Prince Eitel, permission to be married on the same day. Their son’s bride, the Duchess Sophie-Charlotte, was the daughter of the Grand Duke and Grand Duchess of Oldenburg. Only one day earlier, Sophie had arrived at the Brandenburg Gate and entered Berlin in the family’s royal carriage drawn by eight horses and accompanied by her grandmother, Princess Friedrich, as her mother had died a decade earlier. A cavalry of trumpeters led the royal carriage as it made its way past crowds, who had taken every vantage point along the tree-lined Unter den Linden, to the royal palace where a 72 gun salute welcomed the next member of the imperial family. 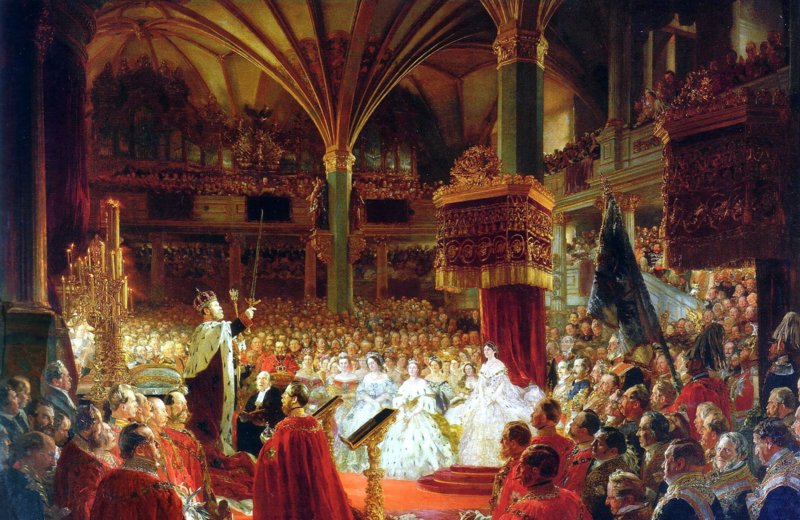 On the following day, 500 guests assembled in the royal chapel where Princess Sophie entered on the arm of Prince Eitel for the wedding ceremony that started at exactly 5pm. She was dressed in pearl white silk and the train of the bride, which was four yards in length, was embroidered with silver roses, reported the New York Times. The Empress then placed a crown, made of green velvet and diamonds, along with a wreath of fresh myrtle upon the head of the bride. As the rings were exchanged a 36 gun salute boomed out over Berlin and the bells of the royal chapel similarly rang out: Sophie was now a wife, a Princess of Prussia and a member of the imperial family. The Silver Anniversary couple, Kaiser Wilhelm II and Augusta Victoria, had their marriage commemorated in several ways, one of which is the card that is pictured above. The royal couple was married on February 27th 1881 and they would remain married for forty years, until her death in 1921. In a period of ten years, between 1882 and 1892, Augusta Victoria bore Wilhelm seven children, six sons and a daughter. Fillets of Turbot steamed in milk, arranged with crayfish tails and coated with a truffle sauce. Shoulder of lamb garnished with cauliflower florets that have been coated in a paprika flavoured Mornay Sauce which are then arranged in fried duchess potato cases made from puréed potato mixed with egg yolks. Turned-out ramekins consisting of a mixture of chicken forcemeat and ‘salpicon a la rein’ made from diced chicken breast, mushrooms and truffles bound in a white sauce. The dish in then decorated with sliced truffles and coated in a Perigueux sauce made from Madeira and truffles. Foie Gras mousse made from puréed force-fed goose livers, cream, aspic jelly and chicken velouté sauce. The dish is served as a free-standing dome with the mousse encased in aspic-jelly that has been set with decorations of sliced truffles, shaped slivers of egg-white and tarragon leaves. Roast pheasant served in full plumage with poached fruits and salad. A dome shaped dessert consisting of Genoa cake soaked in Curacao covered with ricotta cheese, flaked chocolate, crystallised fruits and sugar syrup which is then encased in a layer of chocolate.